He found the House of Isis, Mistress of the Pyramid, by the side of the cavity of the Sphinx, on the north-west side of the House of Osiris, Lord of Rostaw, and he built his pyramid beside the temple of this Goddess[/b], and he built a pyramid for the King's Daughter, Henut-sen, beside this temple. The place of Hwran-Hor-em-akhet is on the south of the House of Isis, Mistress of the Pyramid, and on the north of Osiris, Lord of Rostaw. The plans of the Image of Hor-em-akhet were brought in order to bring to revision the sayings of the disposition of the Image of the Very Redoubtable. He restored the statue all covered in painting, of the Guardian of the Atmosphere, who guides the winds with his gaze. He made to quarry the hind part of the nemes headdress, which was lacking, from gilded stone, and which had a length of about 7 ells [3.7 metres]. The place of Hwran-Hor-em-akhet is the Sphinx and is south of the House of Isis. The House of Osiris is the Sphinx Temple. 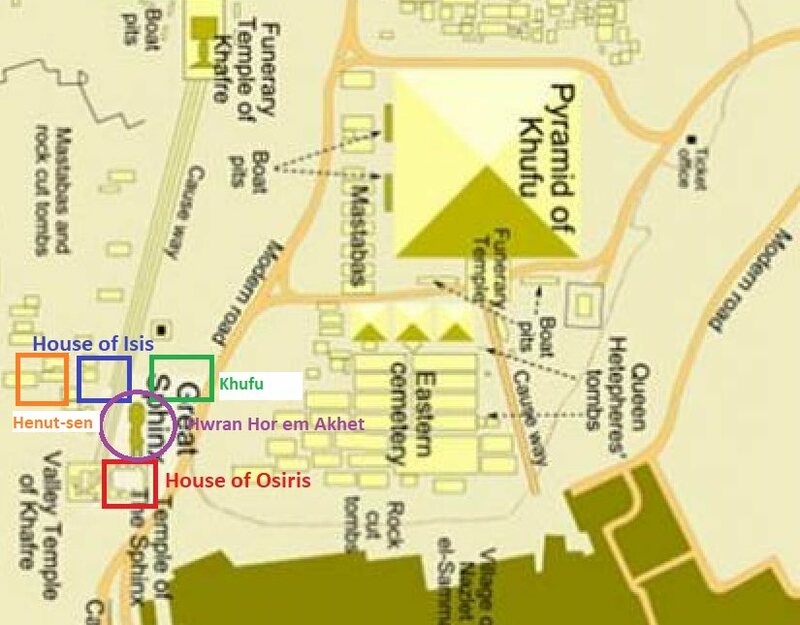 The House of Isis is NW of the Sphinx Temple. The missing? pyramid of Henut-sen is to the left of the House of Isis. Interestingly, Isis is already the Mistress of the Pyramid before Khufu's pyramid has even been constructed. If it wasn't for that Khnum Khuf cartouche the evidence for Khufu, the greatest King of Ancient Egypt, is quite thin on the sand.